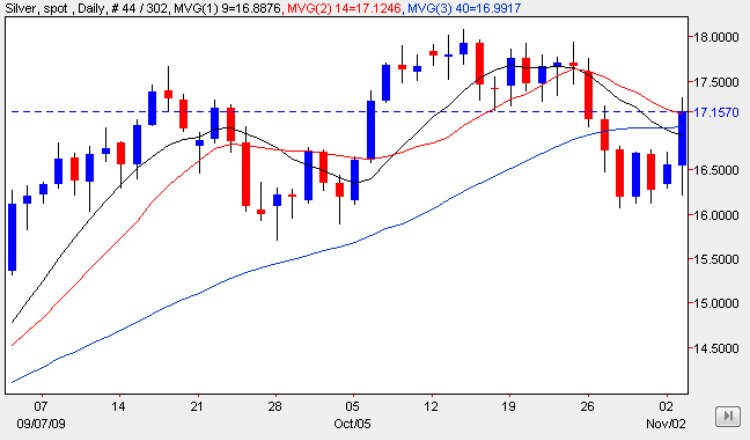 A strong day for silver spot prices, which were dragged higher by the surge in gold prices yesterday, ending the silver trading session with a wide spread up candle which broke and held above all three moving averages, if only marginally! However, this is where the commonality between the two commodities ends, with spot gold breaking out into new high ground, whilst spot silver has more a significant level of resistance directly ahead in the $17.50 to $18.00 per ounce level could prove a significant barrier to any move higher. However, with gold now looking set to break higher in a strong upwards trend, this may be sufficient to see silver prices break above this tricky level, and if so we could see a strong move towards the $20 per ounce level and a good end to the year for bullish silver traders. However, this is far from a ‘given’ at present as we have only just cleared above the three moving averages, and for longer term trend traders my advice is to wait for a break and hold above the resistance level now directly ahead, and if this occurs then we should be more confident that the longer term trend higher is more firmly established for spot silver, as seems the case for spot gold.